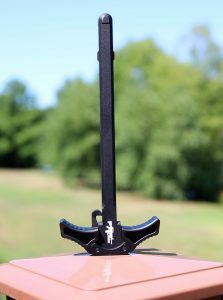 CMMG released some new ambidextrous charging handles recently and we very pleased to see they released one for their Mk47 line of rifles, in addition to one for the AR15. When we review the Mk47 AKS13 Mutant about 2 years ago a major feature of the rifle was the 30 cal BCG and ability to take AK47 magazines. The downside to that was a rifle which couldn’t have a last round bolt hold (due to the ASK47 mag compatibility) and the lack of easy replacement of the charging handle. My solution, until now, was to swap out the charging handle latch with an extended latch. It worked well but I really wanted an ambi handle and something more beefy and sturdier than an extended latch. My request has been answered. You can find the review of both CMMG Ambi charging handles at the 13C YouTube Channel .